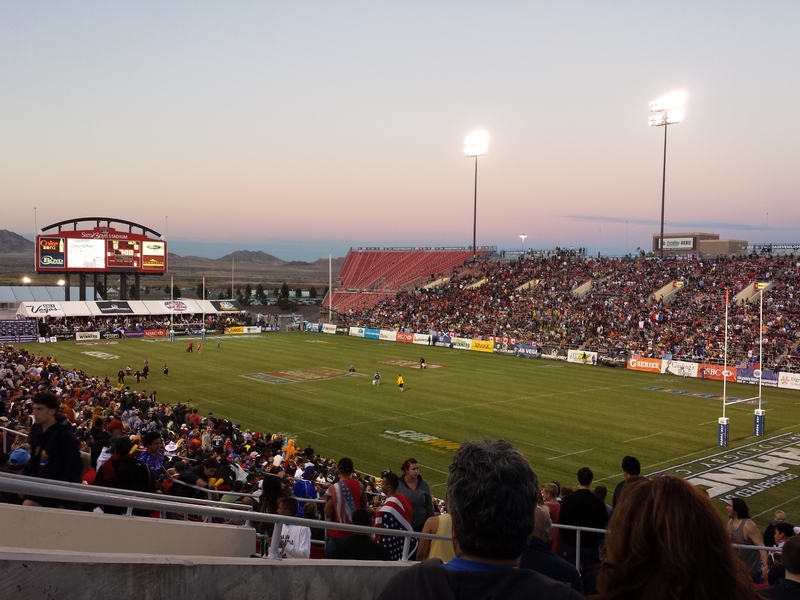 Every year I look forward to the USA Sevens. Every year it seems to get bigger. Every year since it was moved to Las Vegas I feel cheated. I realize that Vegas is all about gambling but watching quality rugby (even though its just the sevens code) is like a slot machine – you put a lot of money in and you rarely ever hit the jackpot. It no longer feels like the focus at the USA Sevens is about rugby but rather more like the by-product of another show that occasionally shows and talks about what’s happening on the field in between the dancing, singing and bawdy gyrating in the stands. My disenfranchisement with the status quo grows every year with every endorsement plug, every overplayed sound byte, every sleepy Emcee who knows absolutely zilch about rugby and whose occasional “Owwww” and “Oohhhh” on a mic that should be turned off if he has no relative commentary to share with rugby mad fans who share seats with inebriated ones. There is nothing that can induce me to keep singing the same bars of “Sweet Caroline” over and over again year after year for three straight days if you can’t give me rugby that is worth swooning over. The three-day format is still a stretch for me although I do like that on Sunday my day is over early (sometimes even earlier that the final whistle which has been at or about 3 p.m. for the past two years). But let’s face it Vegas – the real truth is that you want fans to stick around for three, sometimes four days because you want us to spend more money. You want drunks in the stands. You want us to stay in the stadium and buy from overpriced vendors that you’ve already fleeced so you tell us that we can no longer re-enter the stadium after we have gone out to eat more reasonably priced food. You also limit the items craft and retail vendors can sell because you want to push your own costly apparel. The date change from it’s regular slot in February to January was met with immediate push back from the U.S. rugby community. If it’s not broke (I’m only referring to the date here because obviously a lot is broke) don’t fix it. Some people (myself included) plan their lives around that date so to change it and give us some lame excuses that don’t really add up just makes your planning (pun) seem all the more ridiculous. Pricing is still outrageous and if you thought that we would get used to the “it is what it is” mentality and go on paying that price, look at your stands and count your gate revenue. If you made more than last year it sure didn’t look like it if you were up in the nose bleed seats just so you could lay out on an empty bench, soak up some intermittent rays and take a nap. I was sad and my heart was bleeding when my beloved Manu Samoa Sevens team lost to the Canadian’s who by the way outclassed and outsmarted our boys in blue for the third place victory this weekend. But I’m more sad that the IRB, USA Rugby and USA Sevens aren’t listening to fans. Not the drunk ones who don’t really care what’s going on inside of the stadium so long as their Elvis suits are getting photo op’s and the beer is flowing freely but the real fans who are still wondering when you’re going to make this more about rugby and less about your bottom line. I mean, if the most important thing to you is what happens before, in between and after the rugby, than call it the “USA Party with a few invited rugby friends” and keep the same packaging but let someone else give us the rugby games. Congratulations to South Africa for giving us another look at the future of Springbok and Blitzbokke rugby. Cecil Africa is still a dominating force and a cool customer but names like Branco du Preez and Frankie Horne are now the go-to-guys. Congratulations to New Zealand who are always entertaining on the field and who are just one point shy of the lead in the HSBC Sevens World Series behind South Africa in the points table. DJ Forbes is a class act and by far the best captain in the sevens game. They came up short this time around but every game the boys from Fiji play in is going to be an exciting one. Their flair with the ball is unlike any other team in sevens rugby and their speed is world class. Samoa is blooding some new players at the right time but the inclusion of veterans Lio Lolo, Reupena Levasa and Tom Iosefo had as salivating for a cup final after missing out in the 2013 cup. But the loss of play-maker Sani Niue to suspension after a comeback win against Australia made it hard for the boys to get back to yet another championship under Vegas lights. On the bright side, if Samoa can keep this young group together and get more consistency out of Alatasi Tupou and more touches for Tulolo Tulolo and newcomers Fomai Ah Ki and Kelly Meafua we should be in good shape for the remainder of the Series. The series moves on to Wellington, New Zealand where the home town favorites are expected to regain bragging rights after losing to Kenya in the semi finals last year and settling for third place after a victory over Samoa. But New Zealand will have a tough test against Fiji who have find themselves again fighting for the top spot in Pool B. Samoa on the other hand appears to be in the pool of death having to contend with Australia, upstarts Kenya who were in the Wellington Final a year ago and their Pacific Island cousins Tonga.